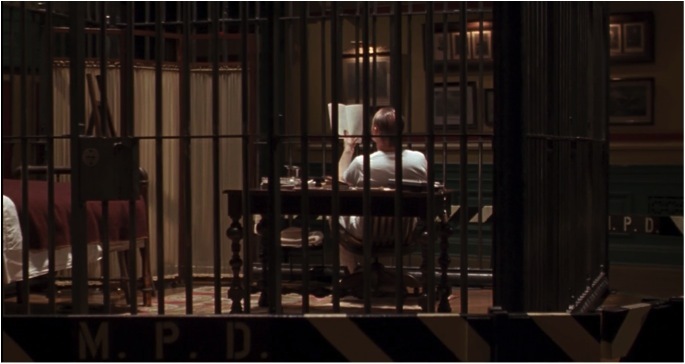 Lecter reads a novel in his cell. The word “cannibal,” much like “monster,” most likely conjures images of a savage, predatory creature that is human only in form and animalistic in all other aspects. It is also associated with sheer necessity, as anyone willing to consume one of their own must have done so in dire straights. This is the source of the uniqueness of Hannibal Lecter of Jonathan Demme’s The Silence of the Lambs, who is shown to be a sophisticated intellectual; he does not cannibalize out of need, but rather treats the act with a certain level of connoisseurship. Because Lecter is discriminating in his tastes, his cannibalism is further removed from the image of a primitive beast who attacks freely and without discretion. In the film, Lecter is a renowned psychiatrist who exhibits incredible skill in “reading” those with whom he comes into contact. Because of this, he can often determine the motives of the people who speak to him and he quickly develops a dislike for those who view him merely as a specimen. Dr. Frederick Chilton, who oversees Lecter at the Baltimore State Hospital for the Criminally Insane, is perhaps most notable in the treatment of Lecter. At Clarice Starling’s first visit to the hospital to interview Lecter, Chilton speaks to her of Lecter: “He is a monster. A pure psychopath. So rare to capture one alive. From a research point of view, he is our most prized asset.” Lecter develops a hatred for Chilton and seeks revenge once he is free, telling Starling he is “having an old friend for dinner” and proceeds to follow Chilton calmly through a crowd of people. Revenge is a common motive for Lecter, as he targets his “captors” throughout the film. While he is held in the Tennessee courthouse, he is placed in a cage that strongly resembles a zoo exhibit where he and all of his drawings are on display, as shown in the accompanying image. He is treated with contempt by the guards, Lieutenant Boyle and Sergeant Pembry, who regularly express their displeasure at his requests, as if he is an animal rather than a human and should not have special desires such as extra-rare lamb chops. In contrast, Starling treats Lecter with respect and wishes to hear his insights, and Lecter reciprocates her respect. When Lecter becomes free, he assures Starling that she should not fear him: “I have no plans to call on you, Clarice. The world’s more interesting with you in it.” His interactions with others are much like his game of quid pro quo with Starling; one will receive what he or she gives. Though both Lecter and murderer-at-large Buffalo Bill are ruthless killers, Lecter’s sophistication distracts from his killings. Lecter has a similar number of victims as Buffalo Bill, if not more, yet the murders of Buffalo Bill are those most emphasized in the film. Buffalo Bill is shown as preying on innocent, defenseless young females who merely tried to help a stranger, while Lecter subdues and cannibalizes the arrogant and insensitive characters of the film. This reflects an idea in Swift’s satirical A Modest Proposal, where it is suggested that the undesirable of Ireland become a part of a fine fricassee for the well-to-do; Lecter creates a fine dining opportunity from the “undesirables” of the film. Throughout the film, people have many words and names to describe Lecter. Chilton believes that Lecter is simply a monster. Considering that the applicable definition of “monster” is “a person who excites horror by wickedness or cruelty” (Random House Dictionary), Lecter could certainly fall in this category. On the other hand, his insight into the case of murderer Buffalo Bill helps subdue perhaps the biggest “monster” of the film. Lecter is given much more personable qualities, and despite also being a murderer, is the more appealing monster of two. The most apt description of Lecter is given by Starling. While riding the elevator with a police officer in the courthouse to visit Lecter, the intrigued officer asks Starling, “Is it true? That he’s some kind of vampire?” Starling thinks for a moment and responds, “They don’t have a name for what he is.” And really, there is no word to name the both terrifying and fascinating Hannibal Lecter. The Silence of the Lambs. Dir. Jonathan Demme. Perf. Jodie Foster and Anthony Hopkins. Orion Pictures. 1991. Netflix.